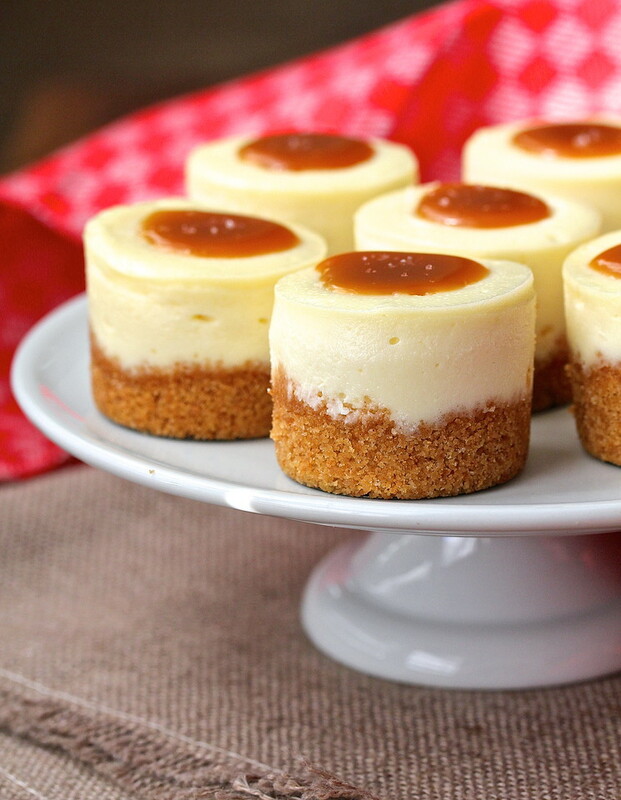 These Mini Cheesecakes with Salted Caramel are so ridiculously delicious and creamy. I'm not sure what it its about this cheesecake recipe, but the combination of ingredients is pretty amazing. This recipe combines cream cheese with a combination of sour cream and heavy cream, along with eggs, sugar, vanilla, and flour. You don't have to worry about water baths to prevent the tops from cracking because these cakes are so tiny! The recipe makes enough for 12 muffin-sized cheesecakes baked in a paper lined muffin tin. I baked these in this really cool mini cheesecake pan. I love the little removable bottoms to the pan because you can push up the little cheesecakes from the bottom (and I needed a reason to justify owning this specialty pan). The cavities of the pan are smaller, so I had enough batter left over for 2 muffin sized cheesecakes. I took these cuties to work and they quickly disappeared. I will definitely be making these again and again. 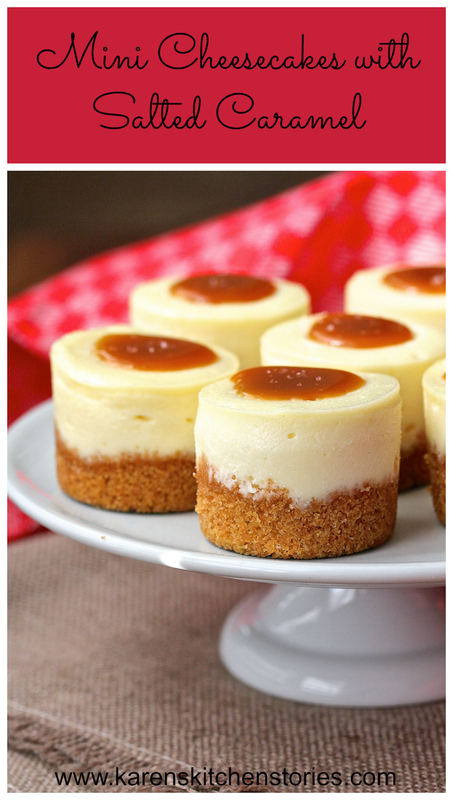 The little cheesecakes are so delicious, and are just the right size. 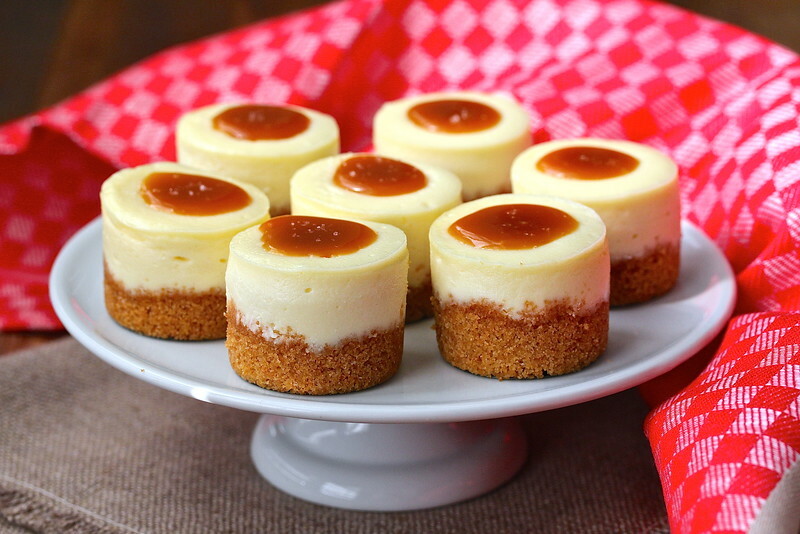 Top these mini cheesecakes with a bit of caramel and some sea salt, or any topping of your choice. I'm pretty sure this will become one of your "go-to" dessert recipes. Be sure to check out these Peaches and Cream Mini Cheesecakes baked in the same mini cheesecake pan! P.S. I have since been able to use the cheesecake pan to make cookies! Check out these Spiced Pumpkin Cookies, and these Espresso Chocolate Cookies. Pretty cute, right? Preheat the oven to 350 degrees F. Line a 12 cavity muffin pan with paper liners, or spray a mini cheesecake pan with spray oil. In a small bowl or the bowl of a mini food processor, mix together the crushed graham crackers, 1 1/2 T sugar, and melted butter. Divide the mixture among the cavities of the pan, and tamp it down into an even layer with some of the Graham cracker mixture coming up the sides. Bake the crust in the oven for 5 minutes. Remove the pan and let cool while you make the filling. In a large bowl, mix the cream cheese and sugar with a mixer on low speed until smooth. Stir in the flour. Add the eggs, one at a time, and mix until just combined. Add the vanilla, sour cream, and heavy cream, and mix until combined. Tap the mixing bowl on the counter about 30 times to release any air bubbles. If you are using a mini cheesecake pan, fill each one up to the top. You will have extra batter. If you are using a muffin pan, Divide the batter among the cavities to about 2/3 full. If you are using a mini cheesecake pan, bake for 15 to 18 minutes, until the centers are slightly jiggly. If you are using a muffin pan, bake for 20 to 23 minutes. Remove from the oven and let cool for an hour. Once they are cooled, refrigerate, covered loosely with wax paper and plastic wrap, for at least 2 hours. They can also be frozen after chilling. Right before serving, top with a small amount of warmed caramel and a sprinkling of sea salt. This recipe was adapted from Erin of Making Memories with your Kids. Karen, these look impeccable!! Now I need to go out (OK, order online) and purchase a specialty pan so I too can make these adorable mini cheesecakes! I am so drooling over these. Thanks Cathy! I was really happy with them, and the pan is pretty neat. Karen, this has GOT to stop. You will not make me buy the pan. You know that, right? You will not. You will not. This was one of the first things I bought, and it lead me down the slippery slope. why, oh why are you doing this to me? If it's any comfort, King Arthur Flour also has some recipes on their site for this pan. I've made these cheesecakes with a raspberry swirl too. Your colleagues will love you! Mini quiches would be perfect! These are too cute!! And they sound and look delicious. Perfect for the holidays. These are terrific Karen - I need to make these for our next family dinner. Thanks! Karen, a quick question - when did you unmold them, only right before serving? Or did you unmold and kept them in the fridge for 2 hours? You can do it either way. These will just slip out easily. Can't wait to see them! Muffin pans will be just fine. I'd use liners unless you have removable bottoms on the muffin pans. What pan makes these exact shape?! Dimensions please and brand. . Or a link would be nice!! Karen, you mention a paper lined tin? Did you use paper in that specialty pan that I just bought? LOL....yes, I fell into the "oooo's and aaahhhh's' trap as well. Can you give any tips on how to make them come out THAT perfect? I have something I have to do for my school district and I'd like to make these. I mean spray the specialty pan with spray oil... not the cheesecakes, lol! oooooo......shortbread! Yum! I've got the spray and will attempt tomorrow!! Hoping they turn out as beautiful as yours! If I want to make this cheesecake in a cheesecake pan what size do I use? Do I make a double batch? I made this for a baby shower and they were amazing but for Easter I want to make a whole big cheesecake because I am making so many other things and it is time-consuming. I'm not sure. I would imagine a 6 inch or 8 inch pan would be about right. You would need to use a water bath. How many days in advance can you make these? About two days, unless you freeze them. You could probably freeze them for about two weeks. Thanks for the link to purchase the pans.. I love the very easy recipe. They turned out perfectly and make a great dessert. Thanks Brenda. I love hearing that! I LOVE this recipe! I made these for a wedding and they were so creamy and good! I was wondering if you happen to have a chocolate version of this recipe? Thank you in advance! Hi Shawna! Thank you! I haven't tried it in chocolate yet, although i did mix 1 1/2 tablespoons of unsweetened cocoa in 3/4 cup of the batter, and then swirled it into the cheesecakes by pouring it in the middle and then swirling with a small knife. I'll have to experiment! I made these last weekend and everyone just loved them. I used the mini cheesecake pan with the push out bottom. They came out perfect the texture, presentation with one slight problem. The caramel slipped off some of them. Do you have any tips to help prevent that from happening? Thank you! I bought the mini pan... do I need to wait the full cooling hour before removing from the pan?? These were a hit this Christmas. I’ll definately will make them again. Thanks for sharing. Thanks so much! I'm glad you loved them.